Bamboo Hair Systems is a multipurpose hair SYSTEM with nourishing blends of proteins, vitamins, peppermint, olive oil, mango, and other properties that helps strengthen the hair with excellent shine and balances moisture. 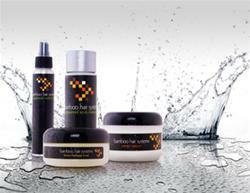 Our Products refresh, relieves anxiety, balances moisture, anti-itch, removes dandruff and odor. The System is great for all hair textures. Including: Peppermint Scrub Shampoo, Mango Masque Conditioner, Peppermint Cooling Mist.